Influenza virus causes significant morbidity and mortality worldwide. Persons infected by influenza virus may be asymptomatic or present with self-limited acute febrile respiratory symptoms. However, those presenting with severe illness may have significant morbidity and mortality. Such a presentation has been found to be associated with high-risk patients, e.g., elderly persons, young children, and patients of chronic medical conditions. Though prophylaxis with antiviral agents may be used to prevent influenza transmission, vaccination is considered the best method for this purpose. As part of the commitment of the Saudi Thoracic Society (STS) toward a long-term enhancement plan for promoting best practices in the field of respiratory diseases, ,,,, a need for development of influenza vaccination guidelines was identified. This is also justified by the fact that Saudi Arabia hosts one of the major global mass gatherings by receiving millions of pilgrims from all over the world for the purpose of the Hajj and Umrah. Therefore, the Scientific Committee for Influenza and Pneumococcal Vaccination (SCIPV) guidelines was created by STS to establish local guidelines based on international recommendations on influenza vaccination, best practices, local literature, and the current settings in Saudi Arabia. The STS guidelines for influenza vaccination aims to standardize the approach among health care professionals (HCPs) in Saudi Arabia in an attempt to support the effort of different governmental agencies in this field, with special attention for specific situations like the Hajj and Umrah. It also aims to disseminate knowledge about vaccination against common respiratory pathogens among HCPs through up-to-date guidelines that are simple to understand and use. Of note, the recommendations related to influenza vaccination apply only to seasonal influenza and do not extend to other pandemics, like the avian flu (H5N1). Evidence category A: Randomized controlled trials with rich body of data. Evidence category B: Randomized controlled trials with limited body of data. Evidence category C: Nonrandomized trials and observational studies. Evidence category D: Consensus judgment by SCIPV members. This category is only used in cases where the provision of some guidance was deemed valuable, but the clinical literature addressing the subject was insufficient to justify placement in one of the other categories. Each section was prepared by a member of the panel and then internally reviewed by other members. The panel conducted round-table discussions frequently and jointly. An international experts reviewed the guidelines, and his recommendations were thoughtfully considered. Influenza vaccination was found to have a positive impact on health care, societal, and individual costs by reducing productivity losses and absenteeism associated with influenza-related illnesses. ,, Though HCPs are among the high-risk group, there are reports showing their low compliance to annual influenza vaccination. ,, Saudi Arabia is not an exception as a survey conducted in the eastern province showed lower awareness of the benefit of vaccination among HCPs. In another survey conducted in six major hospitals in Saudi Arabia, the vaccination rate among HCPs was as low as 38%. Nonavailability of vaccine was considered by 43% of HCPs to be the highest barrier for not providing vaccine for patients. Furthermore, lack of awareness of influenza vaccination was reported by almost 75%. In a campaign conducted in a tertiary care hospital in Saudi Arabia from 2003 to 2007, the coverage rate for HCPs was found to be 21-29%. However, changing the methodology by engaging the Nursing Department as a partner in a vaccination campaign increased the coverage among nurses to 80%, physicians to 74%, and paramedical personnel to 67%. Influenza infection can progress to more serious complications, especially in high-risk groups [Table 1], resulting in increased morbidity and mortality. Pneumonia is the most common complication of influenza, which could be attributed to primary viral pneumonia that presents with severe symptoms, high fever, and dyspnea. It could progress quickly to respiratory failure in 2-5 days. , Secondary, bacterial pneumonia is also an important cause of morbidity and mortality, especially among older persons. Patients typically relapse with higher fevers and productive cough after initial improvement in the symptoms of acute influenza. The most common bacterial pathogens are Streptococcus pneumoniae followed by Staphylococcus aureus, and occasionally community-associated methicillin-resistant S. aureus. Haemophilus influenzae pneumonia may also complicate influenza. , Mixed pneumonia can occur with features of both viral and bacterial pneumonia. Influenza vaccination is the primary tool to prevent influenza infection rather than antiviral chemoprophylaxis. The protection of influenza vaccine depends on inducing humoral immunity, namely neutralizing antibodies against viral capsular antigens, which boost the immune system against the serotypes included in the vaccine. As mentioned, influenza viruses undergo periodic changes in their antigenic envelope glycoproteins, the hemagglutinin (H) and the neuraminidase (N). This explains the spread of infection each year due to the susceptibility of the population to viruses with new antigens. Hence, vaccines are produced annually to match circulating viruses. Three major subtypes of H (H1, H2, and H3) and two subtypes of N (N1 and N2) have been described. Influenza B viruses have less tendency for antigenic changes. Although there are many subtypes of influenza A virus, 1-2 subtypes usually circulate among the human population at any given time. Therefore, most seasonal influenza vaccines include two subtypes of influenza A virus and one subtype of influenza B; hence, it is called a trivalent influenza vaccine (TIV). Recently, quadrivalent vaccines containing two influenza A antigens and two influenza B antigens were introduced. Occasionally, the monovalent vaccine is produced against a candidate pandemic strain, such as the H1N1 vaccine during the 2009/2010 epidemic. Vaccine production takes about 6 months from the selection of strains to final production and distribution. Two types of vaccines are produced annually; one for the Northern Hemisphere and the other for the Southern Hemisphere. This requires biannual productions of the vaccine to ensure its efficacy against related strains for both Hemispheres. Through the WHO global influenza surveillance and response system, the composition of the vaccine is adjusted based on the characteristics of circulating influenza viruses from the previous season. , In the Northern Hemisphere, vaccine strains are selected in February and made available in August of each year; in the Southern Hemisphere, vaccine strains are selected in September and made available in April of the following year. Influenza vaccines are manufactured in two forms: Inactivated influenza vaccines (IIVs) and live-attenuated virus vaccines (LAIVs). As the LAIV is not yet available in Saudi Arabia, influenza vaccination guidelines will focus on IIV (mainly TIV). LAIV is administrated by the intra-nasal administration. Patients can shed vaccine virus strains from their upper respiratory tract for up to 7 days after receiving the LAIV and can test positive for influenza. , Hence, the LAIV may cause a mild form of influenza illness. The LAIV is licensed for use among nonpregnant persons aged 2-49 years. LAIV is not yet available in Saudi Arabia. Severe egg allergy. However, a person with mild allergy (e.g., hives) can receive IIV and must wait 30 min under observation in a clinical setting that can handle allergic reactions. To deal with anaphylactic or hypersensitivity reactions, immediate treatment, including epinephrine 1:1000, should be easily accessible during the administration of the vaccine. Formulations that are not produced in eggs are not yet available in Saudi Arabia. Whenever, there are significant concerns, it is recommended to consult a physician specialized in allergic diseases. Previous history of severe allergy to any of the components of influenza vaccine. Children <6 months of age, as no vaccine is yet approved for this category. If there is an epidemic of influenza in the community, antiviral prophylactic therapy might be administrated during the 2 weeks after receiving the vaccine to protect against the virus till the development of an adequate immune response. , It can also be administered during the 6 weeks for children not previously vaccinated and who require two doses given at least 4 weeks apart. Mild and self-limited oculorespiratory syndrome has been reported to occur within 24 h after receiving IIV. , However, a Canadian study found low recurrence rates of this complication after revaccination with IIV. The presenting symptoms include red eyes, cough, wheezing, and chest tightness. However, it is still controversial whether this syndrome is a coincidental finding, or it is rather related to an immediate hypersensitivity reaction to any of the IIV components. When compared with nonpregnant women, pregnant women infected with influenza virus are prone to severe illnesses with higher morbidity and mortality. ,, They also have a greater risk for serious problems for their infants and during delivery. ,, Hence, seasonal influenza vaccine is commonly used during pregnancy. To assess the safety of influenza vaccine for pregnant women, the vaccine adverse event reporting system (VAERS) project collected reported adverse events in pregnant women receiving the vaccines from 1990 to 2009. The VAERS project did not report unusual patterns of pregnancy complications or adverse fetal outcomes over these two decades. Along the same line, data from six health care organizations in the vaccine safety data link project showed no statistically significant increase in the risk of pregnancy loss 4 weeks after IIV administration. Furthermore, the passive transfer of antibodies from vaccinated women to their infants was found to reduce respiratory illness during the first 6 months of life; hence IIV is not recommended for infants during that period. , In a randomized controlled study, pregnant women who received seasonal influenza vaccine had a reduction in febrile respiratory illnesses by 36%. The vaccine effectiveness for infants was proven by a 63% reduction of laboratory-confirmed influenza and 29% reduction in febrile respiratory illnesses. Therefore, SCIPV recommends IIV influenza vaccination for pregnant women at any stage of pregnancy (evidence A). ,,,,, This recommendation is also extended to postpartum and breastfeeding women. The Saudi Thoracic Society would like to thank the reviewer of the guidelines, Prof. H. Grant Stiver, Emeritus Professor from the Division of Infectious Diseases, Department of Medicine, Faculty of Medicine, University of British Columbia, Vancouver, BC, Canada. The scientific committee for Influenza and Pneumococcal Vaccinations has received full support from the Saudi Thoracic Society. Luckhaupt SE, Sweeney MH, Funk R, Calvert GM, Nowell M, D′Mello T, et al. Influenza-associated hospitalizations by industry, 2009-10 influenza season, United States. Emerg Infect Dis 2012; 18:556-62. Harper SA, Bradley JS, Englund JA, File TM, Gravenstein S, Hayden FG, et al. Seasonal influenza in adults and children - diagnosis, treatment, chemoprophylaxis, and institutional outbreak management: Clinical practice guidelines of the Infectious Diseases Society of America. Clin Infect Dis 2009; 48:1003-32. American Academy of Pediatrics Committee on Infectious Diseases. Antiviral therapy and prophylaxis for influenza in children. Pediatrics 2007;119:852-60. Idrees MM, Saleemi S, Azem MA, Aldammas S, Alhazmi M, Khan J, et al. Saudi guidelines on the diagnosis and treatment of pulmonary hypertension: 2014 updates. Ann Thorac Med 2014;9 Suppl 1:S1-15. Khan JH, Lababidi HM, Al-Moamary MS, Zeitouni MO, Al-Jahdali HH, Al-Amoudi OS, et al. The Saudi Guidelines for the Diagnosis and Management of COPD. Ann Thorac Med 2014; 9:55-76. Al-Hameed F, Al-Dorzi HM, Shamy A, Qadi A, Bakhsh E, Aboelnazar E, et al. The Saudi clinical practice guideline for the diagnosis of the first deep venous thrombosis of the lower extremity. Ann Thorac Med 2015;10:3-15. Al-Moamary MS, Al-Hajjaj MS, Idrees MM, Zeitouni MO, Alanezi MO, Al-Jahdali HH, et al. The Saudi Initiative for Asthma. Ann Thorac Med 2009;4:216-33. Grohskopf LA, Olsen SJ, Sokolow LZ, Bresee JS, Cox NJ, Broder KR, et al. Prevention and control of seasonal influenza with vaccines: Recommendations of the Advisory Committee on Immunization Practices (ACIP) - United States, 2014-15 influenza season. MMWR Morb Mortal Wkly Rep 2014;63:691-7. Centers for Disease Control and Prevention (CDC). Prevention and control of seasonal influenza with vaccines. Recommendations of the Advisory Committee on Immunization Practices - United States, 2013-2014. MMWR Recomm Rep 2013;62:1-43. Jadad AR, Moher M, Browman GP, Booker L, Sigouin C, Fuentes M, et al. Systematic reviews and meta-analyses on treatment of asthma: Critical evaluation. BMJ 2000;320:537-40. Glezen WP, Couch RB. Interpandemic influenza in the Houston area, 1974-76. N Engl J Med 1978;298:587-92. Sullivan KM, Monto AS, Longini IM Jr. Estimates of the US health impact of influenza. Am J Public Health 1993;83:1712-6. Neuzil KM, Zhu Y, Griffin MR, Edwards KM, Thompson JM, Tollefson SJ, et al. Burden of interpandemic influenza in children younger than 5 years: A 25-year prospective study. J Infect Dis 2002;185:147-52. Sharrar RG. National influenza experience in the USA, 1968-69. Bull World Health Organ 1969;41:361-6. Frost W. Epidemiology of influenza. JAMA 1919;73:313-8. World Health Organization. Influenza (Seasonal), Fact sheet N 211. April, 2009. Disponibile al link. Avialble from: http://www.who.int/mediacentre/factsheets/fs211/en/. [Last accessed on 2015 Apr 23]. Barker WH, Mullooly JP. Pneumonia and influenza deaths during epidemics: Implications for prevention. Arch Intern Med 1982;142:85-9. Zimmerman RK, Ahwesh ER. Adult vaccination, part 2: Vaccines for persons at high risk. Teaching Immunization for Medical Education (TIME) Project. J Fam Pract 2000;49 9 Suppl:S51-63. Zimmerman RK. Adult vaccination, part 1: Vaccines indicated by age. Teaching Immunization for Medical Education (TIME) Project. J Fam Pract 2000;49 9 Suppl:S41-50. Molinari NA, Ortega-Sanchez IR, Messonnier ML, Thompson WW, Wortley PM, Weintraub E, et al. The annual impact of seasonal influenza in the US: Measuring disease burden and costs. Vaccine 2007;25:5086-96. Nichol KL, Mallon KP, Mendelman PM. Cost benefit of influenza vaccination in healthy, working adults: An economic analysis based on the results of a clinical trial of trivalent live attenuated influenza virus vaccine. Vaccine 2003;21:2207-17. Nichol KL. Cost-benefit analysis of a strategy to vaccinate healthy working adults against influenza. Arch Intern Med 2001; 161:749-59. Ballestas T, McEvoy SP, Doyle J; SMAHS Healthcare Worker Influenza Vaccination Working Party. Co-ordinated approach to healthcare worker influenza vaccination in an area health service. J Hosp Infect 2009;73:203-9. Maltezou HC, Maragos A, Raftopoulos V, Karageorgou K, Halharapi T, Remoudaki H, et al. Strategies to increase influenza vaccine uptake among health care workers in Greece. Scand J Infect Dis 2008;40:266-8. Maltezou HC, Maragos A, Halharapi T, Karagiannis I, Karageorgou K, Remoudaki H, et al. Factors influencing influenza vaccination rates among healthcare workers in Greek hospitals. J Hosp Infect 2007;66:156-9. Al-Tawfiq JA, Antony A, Abed MS. Attitudes towards influenza vaccination of multi-nationality health-care workers in Saudi Arabia. Vaccine 2009;27:5538-41. Alshammari TM, AlFehaid LS, AlFraih JK, Aljadhey HS. Health care professionals′ awareness of, knowledge about and attitude to influenza vaccination. Vaccine 2014;32:5957-61. Al-Otaibi BM, El-Saed A, Balkhy HH. Influenza vaccination among healthcare workers at a tertiary care hospital in Saudi Arabia: Facing challenges. Ann Thorac Med 2010;5:120-1. Balkhy HH, Abolfotouh MA, Al-Hathlool RH, Al-Jumah MA. Awareness, attitudes, and practices related to the swine influenza pandemic among the Saudi public. BMC Infect Dis 2010;10:42. BinSaeed AA. Characteristics of pandemic influenza A (H1N1) infection in patients presenting to a university hospital in Riyadh, Saudi Arabia. Ann Saudi Med 2010;30:59. Francki RI, Fauquet C, Knudson D, Brown F. Classification and Nomenclature of Viruses: Fifth Report of the International Committee on Taxonomy of Viruses. Virology Division of the International Union of Microbiological Societies: Springer Science & Business Media; 2012. Petrosillo N, Di Bella S, Drapeau CM, Grilli E. The novel influenza A (H1N1) virus pandemic: An update. Ann Thorac Med 2009;4:163-72. Dolin R. Influenza. In: Braunwald E, Fauci AS, Kasper DL, et al., editors. Harrison′s Principles of Internal Medicine. New York: McGraw-Hill; 2008. p. 1127. Memoli MJ, Athota R, Reed S, Czajkowski L, Bristol T, Proudfoot K, et al. The natural history of influenza infection in the severely immunocompromised vs nonimmunocompromised hosts. Clin Infect Dis 2014;58:214-24. Martin CM, Kunin CM, Gottlieb LS, Barnes MW, Liu C, Finland M. Asian influenza A in Boston, 1957-1958. I. Observations in thirty-two influenza-associated fatal cases. AMA Arch Intern Med 1959;103:515-31. Rello J, Pop-Vicas A. Clinical review: Primary influenza viral pneumonia. Crit Care 2009;13:235. Chertow DS, Memoli MJ. Bacterial coinfection in influenza: A grand rounds review. JAMA 2013;309:275-82. Schwarzmann SW, Adler JL, Sullivan RJ Jr, Marine WM. Bacterial pneumonia during the Hong Kong influenza epidemic of 1968-1969. Arch Intern Med 1971;127:1037-41. Tabarsi P, Moradi A, Marjani M, Baghaei P, Hashemian SM, Nadji SA, et al. 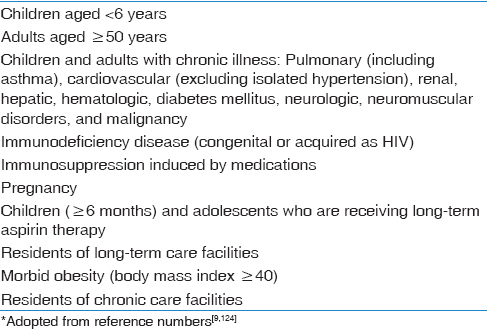 Factors associated with death or intensive care unit admission due to pandemic 2009 influenza A (H1N1) infection. Ann Thorac Med 2011;6:91-5. Vellozzi C, Iqbal S, Broder K. Guillain-Barre syndrome, influenza, and influenza vaccination: The epidemiologic evidence. Clin Infect Dis 2014;58:1149-55. Brankston G, Gitterman L, Hirji Z, Lemieux C, Gardam M. Transmission of influenza A in human beings. Lancet Infect Dis 2007;7:257-65. Bischoff WE, Reid T, Russell GB, Peters TR. Transocular entry of seasonal influenza-attenuated virus aerosols and the efficacy of n95 respirators, surgical masks, and eye protection in humans. J Infect Dis 2011;204:193-9. Center for Disease Control. Influenza antiviral medications: Summary for clinicians. Available from: http://www.cdc.gov/flu/professionals/antivirals/summary-clinicians.htm. [Last retrieved on 2015 Mar 17]. Larson EL, Liverman CT. Preventing transmission of pandemic influenza and other viral respiratory diseases: Personal protective equipment for healthcare workers. Update 2010. National Academies Press; 2011, Available at: http://www.cdc.gov/niosh/docket/review/docket129A/pdfs/NIOSH-129-A_IOMreport.pdf [Last accessed on 2015 Apr 25]. Cowling BJ, Chan KH, Fang VJ, Lau LL, So HC, Fung RO, et al. Comparative epidemiology of pandemic and seasonal influenza A in households. N Engl J Med 2010;362:2175-84. Leekha S, Zitterkopf NL, Espy MJ, Smith TF, Thompson RL, Sampathkumar P. Duration of influenza A virus shedding in hospitalized patients and implications for infection control. Infect Control Hosp Epidemiol 2007;28:1071-6. Grohskopf LA, Shay DK, Shimabukuro TT, Sokolow LZ, Keitel WA, Bresee JS, et al. Prevention and control of seasonal influenza with vaccines: Recommendations of the Advisory Committee on Immunization Practices - United States, 2013-2014. MMWR Recomm Rep 2013;62:1-43. Balkhy H. Avian influenza: The tip of the iceberg. Ann Thorac Med 2008;3:154-7. World Health Organization. Global Influenza Surveillance and Response System (GISRS). Geneva: WHO; 2013. Fiore AE, Shay DK, Broder K, Iskander JK, Uyeki TM, Mootrey G, et al. Prevention and control of seasonal influenza with vaccines: Recommendations of the Advisory Committee on Immunization Practices (ACIP), 2009. MMWR Recomm Rep 2009;58:1-52. Fiore AE, Uyeki TM, Broder K, Finelli L, Euler GL, Singleton JA, et al. Prevention and control of influenza with vaccines: Recommendations of the Advisory Committee on Immunization Practices (ACIP), 2010. MMWR Recomm Rep 2010;59:1-62. Cook IF, Barr I, Hartel G, Pond D, Hampson AW. Reactogenicity and immunogenicity of an inactivated influenza vaccine administered by intramuscular or subcutaneous injection in elderly adults. Vaccine 2006;24:2395-402. Jefferson TO, Rivetti D, Di Pietrantonj C, Rivetti A, Demicheli V. Vaccines for preventing influenza in healthy adults. Cochrane Database Syst Rev 2007; Rev 2:CD001269. Loeb M, Russell ML, Moss L, Fonseca K, Fox J, Earn DJ, et al. Effect of influenza vaccination of children on infection rates in Hutterite communities: A randomized trial. JAMA 2010;303:943-50. Castilla J, Godoy P, Domínguez A, Martínez-Baz I, Astray J, Martín V, et al. Influenza vaccine effectiveness in preventing outpatient, inpatient, and severe cases of laboratory-confirmed influenza. Clin Infect Dis 2013;57:167-75. Martínez-Baz I, Navascués A, Pozo F, Chamorro J, Albeniz E, Casado I, et al. Influenza vaccine effectiveness in preventing inpatient and outpatient cases in a season dominated by vaccine-matched influenza B virus. Hum Vaccin Immunother 2015;11:1626-33. Bellei NC, Carraro E, Castelo A, Granato CF. Risk factors for poor immune response to influenza vaccination in elderly people. Braz J Infect Dis 2006;10:269-73. Thomas RE, Jefferson TO, Demicheli V, Rivetti D. Influenza vaccination for health-care workers who work with elderly people in institutions: A systematic review. Lancet Infect Dis 2006;6:273-9. Nichol KL, Nordin JD, Nelson DB, Mullooly JP, Hak E. Effectiveness of influenza vaccine in the community-dwelling elderly. N Engl J Med 2007;357:1373-81. Ali T, Scott N, Kallas W, Halliwell ME, Savino C, Rosenberg E, et al. Detection of influenza antigen with rapid antibody-based tests after intranasal influenza vaccination (FluMist). Clin Infect Dis 2004;38:760-2. Vesikari T, Karvonen A, Korhonen T, Edelman K, Vainionpää R, Salmi A, et al. A randomized, double-blind study of the safety, transmissibility and phenotypic and genotypic stability of cold-adapted influenza virus vaccine. Pediatr Infect Dis J 2006;25:590-5.
al-Hajjar S, Akhter J, al Jumaah S, Hussain Qadri SM. Respiratory viruses in children attending a major referral centre in Saudi Arabia. Ann Trop Paediatr 1998;18:87-92. Govaert TM, Thijs CT, Masurel N, Sprenger MJ, Dinant GJ, Knottnerus JA. The efficacy of influenza vaccination in elderly individuals. A randomized double-blind placebo-controlled trial. JAMA 1994;272:1661-5. Osterholm MT, Kelley NS, Sommer A, Belongia EA. Efficacy and effectiveness of influenza vaccines: A systematic review and meta-analysis. Lancet Infect Dis 2012;12:36-44. Englund JA, Walter EB, Gbadebo A, Monto AS, Zhu Y, Neuzil KM. Immunization with trivalent inactivated influenza vaccine in partially immunized toddlers. Pediatrics 2006;118:e579-85. Manzoli L, Schioppa F, Boccia A, Villari P. The efficacy of influenza vaccine for healthy children: A meta-analysis evaluating potential sources of variation in efficacy estimates including study quality. Pediatr Infect Dis J 2007;26:97-106. Negri E, Colombo C, Giordano L, Groth N, Apolone G, La Vecchia C. Influenza vaccine in healthy children: A meta-analysis. Vaccine 2005;23:2851-61. Neuzil KM, Jackson LA, Nelson J, Klimov A, Cox N, Bridges CB, et al. Immunogenicity and reactogenicity of 1 versus 2 doses of trivalent inactivated influenza vaccine in vaccine-naive 5-8-year-old children. J Infect Dis 2006;194:1032-9. Rhorer J, Ambrose CS, Dickinson S, Hamilton H, Oleka NA, Malinoski FJ, et al. Efficacy of live attenuated influenza vaccine in children: A meta-analysis of nine randomized clinical trials. Vaccine 2009;27:1101-10. Jefferson T, Smith S, Demicheli V, Harnden A, Rivetti A, Di Pietrantonj C. Assessment of the efficacy and effectiveness of influenza vaccines in healthy children: Systematic review. Lancet 2005;365:773-80. Ndiaye SM, Hopkins DP, Shefer AM, Hinman AR, Briss PA, Rodewald L, et al. Interventions to improve influenza, pneumococcal polysaccharide, and hepatitis B vaccination coverage among high-risk adults: A systematic review. Am J Prev Med 2005;28 5 Suppl:248-79. Annoynymous. Seasonal Influenza Vaccination - FAQ 2015. Available from: http://www.moh.gov.sa/en/Flu/Pages/QA.aspx. [Last accessed on 2015 Jul 17]. Gross PA, Hermogenes AW, Sacks HS, Lau J, Levandowski RA. The efficacy of influenza vaccine in elderly persons. A meta-analysis and review of the literature. Ann Intern Med 1995; 123:518-27. Carman WF, Elder AG, Wallace LA, McAulay K, Walker A, Murray GD, et al. Effects of influenza vaccination of health-care workers on mortality of elderly people in long-term care: A randomised controlled trial. Lancet 2000;355:93-7. Potter J, Stott DJ, Roberts MA, Elder AG, O′Donnell B, Knight PV, et al. Influenza vaccination of health care workers in long-term-care hospitals reduces the mortality of elderly patients. J Infect Dis 1997;175:1-6. Lee PY, Matchar DB, Clements DA, Huber J, Hamilton JD, Peterson ED. Economic analysis of influenza vaccination and antiviral treatment for healthy working adults. Ann Intern Med 2002;137:225-31. Hayward AC, Harling R, Wetten S, Johnson AM, Munro S, Smedley J, et al. Effectiveness of an influenza vaccine programme for care home staff to prevent death, morbidity, and health service use among residents: Cluster randomised controlled trial. BMJ 2006;333:1241. Hurwitz ES, Haber M, Chang A, Shope T, Teo S, Ginsberg M, et al. Effectiveness of influenza vaccination of day care children in reducing influenza-related morbidity among household contacts. JAMA 2000;284:1677-82. Esposito S, Marchisio P, Cavagna R, Gironi S, Bosis S, Lambertini L, et al. Effectiveness of influenza vaccination of children with recurrent respiratory tract infections in reducing respiratory-related morbidity within the households. Vaccine 2003;21:3162-8. Nordin J, Mullooly J, Poblete S, Strikas R, Petrucci R, Wei F, et al. Influenza vaccine effectiveness in preventing hospitalizations and deaths in persons 65 years or older in Minnesota, New York, and Oregon: Data from 3 health plans. J Infect Dis 2001;184:665-70. Hak E, Nordin J, Wei F, Mullooly J, Poblete S, Strikas R, et al. Influence of high-risk medical conditions on the effectiveness of influenza vaccination among elderly members of 3 large managed-care organizations. Clin Infect Dis 2002;35:370-7. Vu T, Farish S, Jenkins M, Kelly H. A meta-analysis of effectiveness of influenza vaccine in persons aged 65 years and over living in the community. Vaccine 2002;20:1831-6. Erlewyn-Lajeunesse M, Brathwaite N, Lucas JS, Warner JO. Recommendations for the administration of influenza vaccine in children allergic to egg. BMJ 2009;339:b3680. Puig-Barberà J, Diez-Domingo J, Pérez Hoyos S, Belenguer Varea A, González Vidal D. Effectiveness of the MF59-adjuvanted influenza vaccine in preventing emergency admissions for pneumonia in the elderly over 64 years of age. Vaccine 2004; 23:283-9. Joseph C, Goddard N. Influenza vaccine uptake in the elderly: Results from a rapid assessment of the effectiveness of new government policy in England for the winters 2000/2001 and 2001/2002. Vaccine 2003;21:1137-48. France EK, Glanz JM, Xu S, Davis RL, Black SB, Shinefield HR, et al. Safety of the trivalent inactivated influenza vaccine among children: A population-based study. Arch Pediatr Adolesc Med 2004;158:1031-6. Hambidge SJ, Glanz JM, France EK, McClure D, Xu S, Yamasaki K, et al. Safety of trivalent inactivated influenza vaccine in children 6 to 23 months old. JAMA 2006;296:1990-7. Govaert TM, Dinant GJ, Aretz K, Masurel N, Sprenger MJ, Knottnerus JA. Adverse reactions to influenza vaccine in elderly people: Randomised double blind placebo controlled trial. BMJ 1993;307:988-90. Neuzil KM, Dupont WD, Wright PF, Edwards KM. Efficacy of inactivated and cold-adapted vaccines against influenza A infection, 1985 to 1990: The pediatric experience. Pediatr Infect Dis J 2001;20:733-40. Rosenberg M, Sparks R, McMahon A, Iskander J, Campbell JD, Edwards KM. Serious adverse events rarely reported after trivalent inactivated influenza vaccine (TIV) in children 6-23 months of age. Vaccine 2009;27:4278-83. Berry BB, Ehlert DA, Battiola RJ, Sedmak G. Influenza vaccination is safe and immunogenic when administered to hospitalized patients. Vaccine 2001;19:3493-8. Neuzil KM. The safety of inactivated influenza vaccine adults and children with asthma. J Pediatr 2002;140:632. Wright PF, Thompson J, Vaughn WK, Folland DS, Sell SH, Karzon DT. Trials of influenza A/New Jersey/76 virus vaccine in normal children: An overview of age-related antigenicity and reactogenicity. J Infect Dis 1977;136 Suppl:S731-41. Ohmit SE, Victor JC, Teich ER, Truscon RK, Rotthoff JR, Newton DW, et al. Prevention of symptomatic seasonal influenza in 2005-2006 by inactivated and live attenuated vaccines. J Infect Dis 2008;198:312-7. Ohmit SE, Victor JC, Rotthoff JR, Teich ER, Truscon RK, Baum LL, et al. Prevention of antigenically drifted influenza by inactivated and live attenuated vaccines. N Engl J Med 2006;355:2513-22. Skowronski DM, Strauss B, Kendall P, Duval B, De Serres G. Low risk of recurrence of oculorespiratory syndrome following influenza revaccination. CMAJ 2002;167:853-8. Nakayama T, Onoda K. Vaccine adverse events reported in post-marketing study of the Kitasato Institute from 1994 to 2004. Vaccine 2007;25:570-6. Vellozzi C, Burwen DR, Dobardzic A, Ball R, Walton K, Haber P. Safety of trivalent inactivated influenza vaccines in adults: Background for pandemic influenza vaccine safety monitoring. Vaccine 2009;27:2114-20. Alzeer AH. Respiratory tract infection during Hajj. Ann Thorac Med 2009;4:50-3. Rashid H, Shafi S, Haworth E, El Bashir H, Memish ZA, Sudhanva M, et al. Viral respiratory infections at the Hajj: Comparison between UK and Saudi pilgrims. Clin Microbiol Infect 2008;14:569-74. Balkhy HH, Memish ZA, Bafaqeer S, Almuneef MA. Influenza a common viral infection among Hajj pilgrims: Time for routine surveillance and vaccination. J Travel Med 2004;11:82-6. Qureshi H, Gessner BD, Leboulleux D, Hasan H, Alam SE, Moulton LH. The incidence of vaccine preventable influenza-like illness and medication use among Pakistani pilgrims to the Haj in Saudi Arabia. Vaccine 2000;18:2956-62. Mustafa AN, Gessner BD, Ismail R, Yusoff AF, Abdullah N, Ishak I, et al. A case-control study of influenza vaccine effectiveness among Malaysian pilgrims attending the Haj in Saudi Arabia. Int J Infect Dis 2003;7:210-4. Annoynymous. MOH Reiterates Adherence to the Health Requirements by Umrah and Hajj Pilgrims 2015. Available from: http://www.moh.gov.sa/en/Ministry/MediaCenter/News/Pages/news-2015-07-06-001.aspx. [Last accessed on 2015 Jul 10]. Chadha MS, Potdar VA, Saha S, Koul PA, Broor S, Dar L, et al. Dynamics of influenza seasonality at sub-regional levels in India and implications for vaccination timing. PLoS One 2015; 10:e0124122. Saha S, Chadha M, Al Mamun A, Rahman M, Sturm-Ramirez K, Chittaganpitch M, et al. Influenza seasonality and vaccination timing in tropical and subtropical areas of southern and South-Eastern Asia. Bull World Health Organ 2014;92:318-30. Brookes L, Pavia AT, Poland GA. Why Is Influenza So Difficult to Prevent and Treat?, Will We See Improvement Any Time Soon?. Available at: http://www.avogel.it/pubblicazioni/Doc/Why-is-Influenza-so-difficult-to-prevent-and-treat.pdf; [Last accessed on 2015 Apr 11]. Neuzil KM, Reed GW, Mitchel EF, Simonsen L, Griffin MR. Impact of influenza on acute cardiopulmonary hospitalizations in pregnant women. Am J Epidemiol 1998;148:1094-102. Dodds L, McNeil SA, Fell DB, Allen VM, Coombs A, Scott J, et al. Impact of influenza exposure on rates of hospital admissions and physician visits because of respiratory illness among pregnant women. CMAJ 2007;176:463-8. Schanzer DL, Langley JM, Tam TW. Influenza-attributed hospitalization rates among pregnant women in Canada 1994-2000. J Obstet Gynaecol Can 2007;29:622-9. McNeil SA, Dodds LA, Fell DB, Allen VM, Halperin BA, Steinhoff MC, et al. Effect of respiratory hospitalization during pregnancy on infant outcomes. Am J Obstet Gynecol 2011;204 6 Suppl 1:S54-7. Bloom-Feshbach K, Simonsen L, Viboud C, Mølbak K, Miller MA, Gottfredsson M, et al. Natality decline and miscarriages associated with the 1918 influenza pandemic: The Scandinavian and United States experiences. J Infect Dis 2011;204:1157-64. Håberg SE, Trogstad L, Gunnes N, Wilcox AJ, Gjessing HK, Samuelsen SO, et al. Risk of fetal death after pandemic influenza virus infection or vaccination. N Engl J Med 2013;368:333-40. Moro PL, Broder K, Zheteyeva Y, Walton K, Rohan P, Sutherland A, et al. Adverse events in pregnant women following administration of trivalent inactivated influenza vaccine and live attenuated influenza vaccine in the Vaccine Adverse Event Reporting System, 1990-2009. Am J Obstet Gynecol 2011;204: 146.e1-7. Irving SA, Kieke BA, Donahue JG, Mascola MA, Baggs J, DeStefano F, et al. Trivalent inactivated influenza vaccine and spontaneous abortion. Obstet Gynecol 2013;121:159-65. Puck JM, Glezen WP, Frank AL, Six HR. Protection of infants from infection with influenza A virus by transplacentally acquired antibody. J Infect Dis 1980;142:844-9. Zaman K, Roy E, Arifeen SE, Rahman M, Raqib R, Wilson E, et al. Effectiveness of maternal influenza immunization in mothers and infants. N Engl J Med 2008;359:1555-64. Munoz FM, Greisinger AJ, Wehmanen OA, Mouzoon ME, Hoyle JC, Smith FA, et al. Safety of influenza vaccination during pregnancy. Am J Obstet Gynecol 2005;192:1098-106. Heinonen OP, Shapiro S, Monson RR, Hartz SC, Rosenberg L, Slone D. Immunization during pregnancy against poliomyelitis and influenza in relation to childhood malignancy. Int J Epidemiol 1973;2:229-35. Pool V, Iskander J. Safety of influenza vaccination during pregnancy. Am J Obstet Gynecol 2006;194:1200. Benowitz I, Esposito DB, Gracey KD, Shapiro ED, Vázquez M. Influenza vaccine given to pregnant women reduces hospitalization due to influenza in their infants. Clin Infect Dis 2010;51:1355-61. Vaccines against influenza WHO position paper - November 2012. Wkly Epidemiol Rec 2012;87:461-76. Fiore AE, Fry A, Shay D, Gubareva L, Bresee JS, Uyeki TM; Centers for Disease Control and Prevention (CDC). Antiviral agents for the treatment and chemoprophylaxis of influenza - Recommendations of the Advisory Committee on Immunization Practices (ACIP). MMWR Recomm Rep 2011;60:1-24.